When you lease equipment, you'll see a lot of terms used regarding what happens when your lease is over. Today we'll just talk about the FMV equipment lease buyout. ...which also means the same thing as a "true lease..."
When a leasing company mentions an FMV, true, or operating lease, they are talking about what happens after you make the last payment. Now, this is where fair market value comes in. You're not sure at the beginning of the lease how much that final payment will be if you want to keep the equipment. The amount you'll have to pay to keep the equipment is the "fair market value." Fair Market Value = how much your equipment is worth. Now - here's the tricky part. Worth how much according to whom? Almost sounds like a recipe for a fight, doesn't it? How Should Fair Market Value be Determined? "The value of a piece of equipment if the equipment were to be sold in a transaction determined at arm's length, between a willing buyer and a willing seller, for equivalent property and under similar terms and conditions. Simply, the actual market value of the lease asset." Imagine you leased a piece of equipment 48 months ago under a true lease. ... let's pretend it was a Kenworth T800 dump truck that had been purchased new in 2012. Now, let's also assume you want to keep the truck at the end. How much should it be worth? The phrase above, "under equivalent terms and conditions" is important. Many people think what an asset is "worth" is the asking prices set by equipment dealers. But remember, you're not a dealer. There are two ways to determine an equipment's value. The best way is to hire a third party equipment appraiser. You can find one in your area at the Equipment Appraiser's Association of North America. 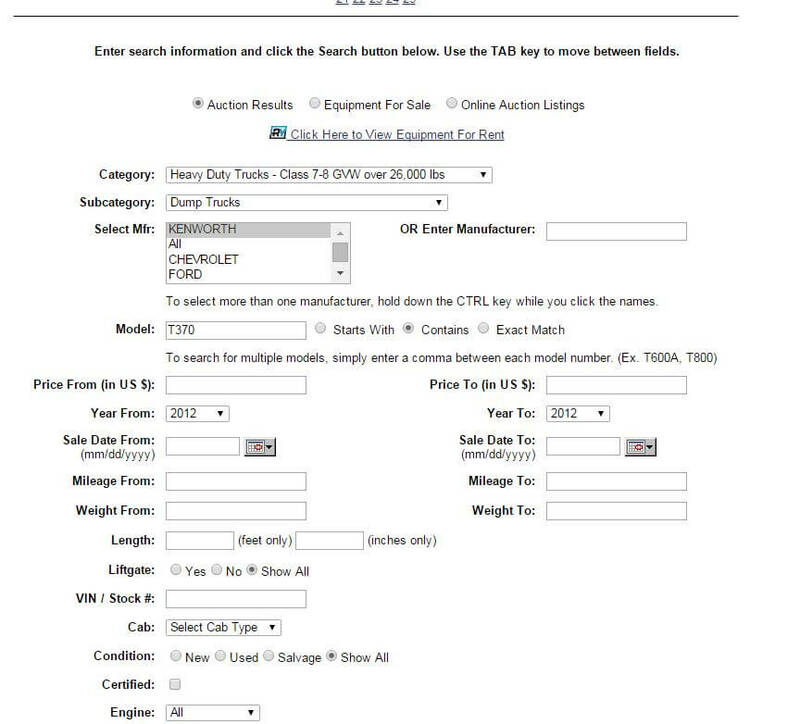 If you're just curious as to what your equipment might be worth, looking up auction values can give you a good guesstimate. For trucks, a good source is www.truckpaper.com. Enter your equipment type into the website, and when the search results come up, scroll all the way to the bottom. 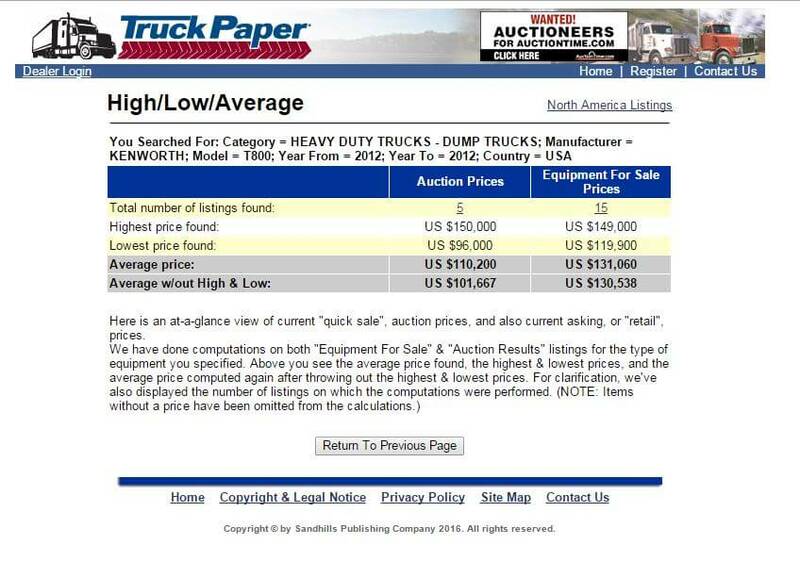 Notice that the average auction price of a 2012 Kenworth T800 is $101,667, but the average asking prices were $130,538. That's a roughly 30% difference. Remember that leasing companies have a huge advantage over you in regards to information. While we look at these transactions all day, most small businesses will only occasionally go through the process of leasing equipment. Unfortunately, some unscrupulous leasing companies will use this advantage, knowing that many of their customers don't realize that the value of the equipment at lease end is related to actual recorded sales prices, not asking prices of dealers. ...not knowing this could potentially cost you about $30,000. When your lease term ends, it's important to know this - so that you can tell if the leasing company is being straight with you about the value. If not using an appraiser, if you can find "comps" - equivalent equipment sales, you can sometimes negotiate the buyout with your leasing company and save a bundle. Note: If your equipment doesn't have a huge website with auction results, Ebay can be your secret weapon. Another problem with FMV leases regards to the time period in which you must inform the leasing company whether you wish to return or purchase the equipment. It's important to read your contracts carefully. "Lessee must inform [company] of intent to purchase or return [equipment] in between 180 and 90 days of lease expiration." Customers not noticing this clause in their contracts is an enormous profit center for some leasing companies. In most states, the lease company is under no obligation to remind you to let them know what you're going to do with the equipment. The lease can roll over for another 6 or 12 months... pure profit for the leasing company. Do you want to know the tragedy of all this? The misinformation about operating leases leads many small businesses to insist on only doing $1 buyout leases. ($1 buyout means you own the equipment at the end for $1). Honestly, it's hard to blame you if this is the case. However, in some cases, these sorts of "true" leases can be much better for your pocketbook. Your payments will be lower on an operating lease than on a $1 buyout. Fair market value leases aren't always going to be your best choice. However, in many cases, they should be considered as part of your buying process. The most important part is knowing how to figure out if a company is being honest with you about the process. You should go find a company that will treat you fairly. Do you want to investigate all your lease options, without any of the BS?